After the questionnaires were evaluated, individual footprints for all areas of life and consumption were calculated for households. Each household received a report with graphs, broken down into the different areas of life, revealing their greatest savings potential to achieve a lifestyle that does not exceed 3 tonnes of CO2 per person. 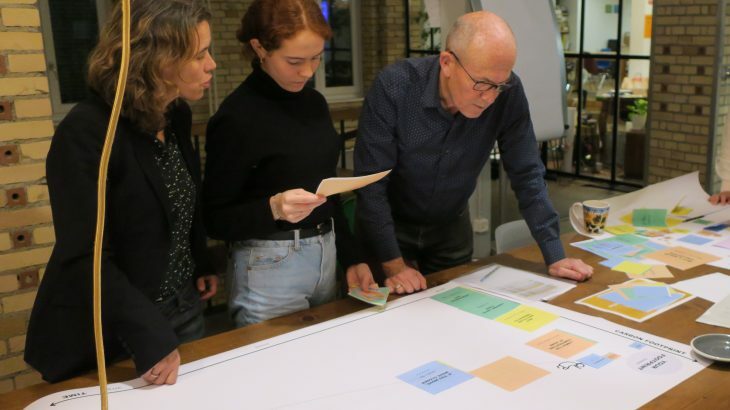 Four of six households attended the roadmapping workshop in the Impact Hub Zurich. The remaining two households received a private workshop at home, as the families with small children were not so mobile or young couples were much involved in their jobs. The roadmapping was fun for the participants, as their reduction targets were visualized on a large poster with differently sized and colored tiles, symbolizing various actions for the reduction of their footprint.The placement of the selected actions on a timeline was pretty easy for the participants and was completed after 5-10 minutes. After the roadmapping, the households were very eager to start with their experiments. One of the household even designed a detailed action plan on an Excel spreadsheet.